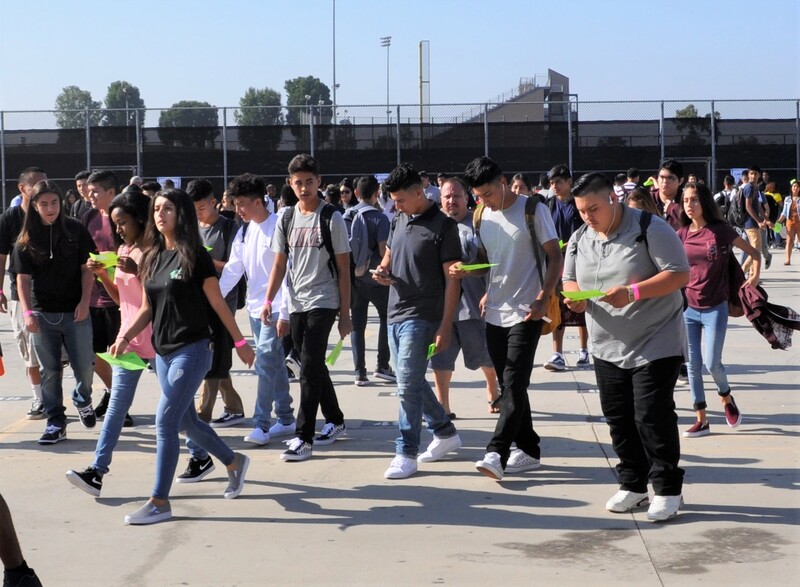 BELLFLOWER – Balloons and bouncy houses, Buccaneer PRIDE and college classes greeted Bellflower Unified students as they arrived at Bellflower Middle/High School on Monday for their first day of classes. And – coming soon! – a state-of-the-art soccer field fit for the school’s 2017 CIF champions. “It’s always exciting to see the students return to school, and this year, we have many new opportunities to present to them,” Principal Mike Lundgren said. The school, which enrolls about 2,500 students in grades seven through 12, was decked out in balloons and, for the first time, a series of bouncy houses, slides and games as a way of bringing students together on their first day. On Monday, students rotated through activities, including a welcome back activity, team-building by grade level with the bouncy houses and a DJ, and exploration of college and career options. On Tuesday, the PRIDE message is reinforced in a positive way during classes. The effort is part of Bellflower Unified’s Positive Behavioral Interventions and Supports (PBIS) system of discipline. Just before school started at 9:30 a.m., parent Tracy Hightower was saying goodbye to her two sons, Julian, 12, who will be in seventh grade, and Angelo, 16, a junior. Julian Hightower said he is looking forward to seeing his friends and getting busy again after a relaxing summer. Angelo Hightower said his priority this year will be high grades. 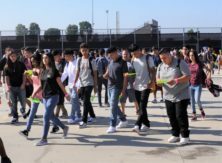 Because the school includes middle and high school, Bellflower High students help to mentor the seventh-graders through Link Crew. The team includes Krystal Leyva, 15, a junior. “We help them find places and give them guidance,” she said. Meanwhile, workers this fall will complete construction of a new soccer field. The field, which also will be used for junior varsity and frosh football, will feature the highest of quality artificial surfaces. Bellflower High’s soccer team won its second CIF title in three years in 2017. Also as part of the project, a reconfigured parking lot will provide safe and easy access to campus for students and to athletic events at Ron Yary Stadium for community members. BUSD_FIRST_DAY_1: Bellflower Middle/High School students examine their schedules before classes commence on the first day of the semester, Aug. 28. The students spend their first days on team-building, college exploration and connecting with the school’s PRIDE mantra. BUSD_FIRST_DAY_2: Tracy Hightower, secretary of the Bellflower Middle/High School Parent Teacher Student Association, drops off sons Julian, 12, left, and Angelo, 16, right, for their first day of school on Aug. 28. BUSD_FIRST_DAY_2: Construction crews are working on an artificial surface soccer field at Bellflower Middle/High School on Aug. 28, the first day of school. The field, which will also serve students on the frosh and junior varsity football teams, will be completed this fall.